Geologic evidence suggests that the modern caldera of Kīlauea formed shortly before 1500 AD. Repeated small collapses may have affected parts of the caldera floor, possibly as late as 1790. For over 300-400 years, the caldera was below the water table. Kilauea is an explosive volcano; several phreatic eruptions have occurred in the past 1,200 years. (Phreatic eruptions, also called phreatic explosions, occur when magma heats ground or surface water.) The extreme temperature of the magma (from 932 to 2,138 °F) causes near-instantaneous evaporation to steam, resulting in an explosion of steam, water, ash and rock – the 1980 eruption of Mount St. Helens was a phreatic eruption. Barefoot walkers left thousands of footprints in wet volcanic ash within a few miles southwest of Kīlauea’s summit. Many historians and Hawaiians believe the footprints were made by Keōua and his warriors. Keōua was known to be in the area at the time, and previous thought suggested this part of the desert did not have pre-contact use, so it was narrowed down to them. Scientists later investigated – one approach was to look deeper at the evidence. If the footprints aren’t Keōua’s warriors, then how did one-third of his warriors die? On August 1, 1916, President Woodrow Wilson signed the country’s 13th national park into existence – Hawaiʻi National Park. At first, the park consisted of only the summits of Kilauea and Mauna Loa on Hawaiʻi and Haleakalā on Maui. 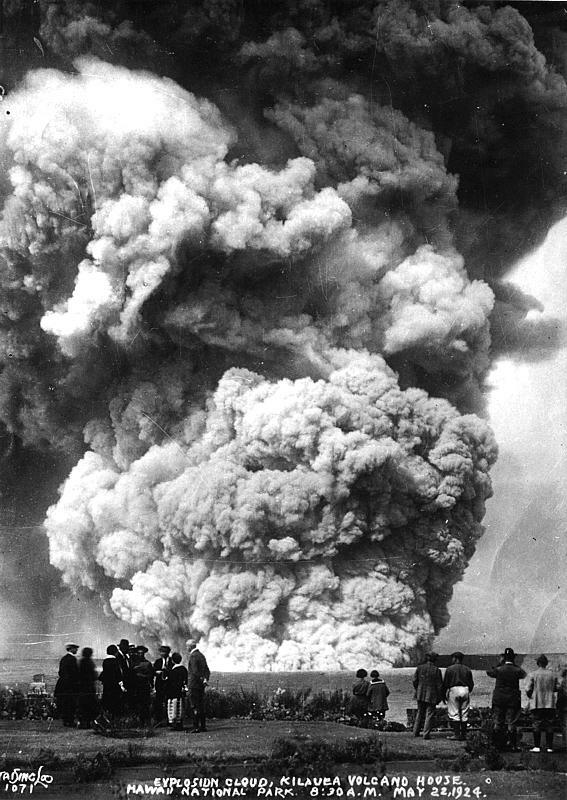 (Lots of good information here is from USGS, NPS and Jade Moniz-Nakamura) The image shows the 1924 eruption column rising from Halemaʻumaʻu near the end of the explosion, taken from outside Volcano House (Tai Sing Loo, USGS.) I added a couple of other images in a folder of like name in the Photos section on my Facebook and Google+ pages. Legendary sources indicate that Hilo (‘to braid’) was, among other things, renowned for its rain and fertility. Hilo is likely to have been one of the first Polynesian settlement areas on Hawai‘i Island; oral history and local legend indicate that Polynesians first settled Hilo Harbor around 1100 AD. Early settlers would have found a protected bay, surrounded by fertile lands for agriculture, and well watered by regular rainfall and natural springs. Natural waterways and wetlands were modified to create fishponds and planting areas. Early accounts of Hilo Bay describe a long black sand beach stretching along present day Bay Front from the Wailuku River to the Wailoa River. Coconut Island is just east of the Wailoa River, and Reed’s Bay and Kūhiō Bay are just east of Coconut Island. Hilo was a Royal Center for many of the early chiefs. When Captain George Vancouver arrived at Hilo Bay in 1794, Kamehameha was living at Waiākea and preparing his fleet of war canoes for his coming conquest of the other Hawaiian Islands, which ultimately led to the consolidation of the Hawaiian Kingdom. Vancouver’s crew surveyed Hilo as a potential anchorage, but found the surf too problematic to effect a landing and declared the bay only marginally sufficient for anchorage. Missionary William Ellis arrived in Hilo Harbor in 1823, when the main settlement there was called Waiākea. Christian missionaries continued to come to Hilo Harbor until the mid-19th Century. The missionaries were followed by trade ships and whalers that used the Hilo Harbor port. Between 1824 and 1848 Hilo became a significant center for foreign activities, primarily as a result of the establishment of religious mission stations by American missionaries. By 1874, Hilo ranked as the second largest population center in the islands, and within a few years shortly thereafter Hilo with its fertile uplands, plentiful water supply, and good port became a major center for sugarcane production and export. Passengers and cargo landed at Hilo in the surf along the beach until about 1863, when a wharf was constructed at the base of present day Waiānuenue Street. At one time both cargo and passengers were hoisted in a basket-like sling out to a waiting row boat which took the goods or passengers to the waiting ship. If the weather was rough, landing took place on the beach. The wooden wharf was replaced by an iron pile wharf in 1865, and was extended between 1889 and 1890. Raw sugar was brought by inter-island steamships from the Hāmākua coast to Hilo before being shipped overseas. The northern side of the bay became a focal point for the community’s trade and commerce. During this time, Hilo was ranked as the third most frequented port for whaling vessels in need of repair and re-provisioning. With its foundations in the missionary Hilo Boarding School, commercial sugarcane cultivation and sugar production became the central economic focus for the Hilo area lasting until the 1970s. The Waiākea Mill Company, in operation between 1879 and 1948, with thousands of acres of cultivated fields, established its mill operation at Wailoa Pond. The Reciprocity Treaty (1876) between the Kingdom of Hawaiʻi and the US, along with the increase in commerce associated with the growing sugar industry and improvements in transportation in the Hilo area, prompted the decision that a harbor facility should be built on the calmer Waiākea side of Hilo Harbor. The government wharf at Waiākea was constructed at Kalauokukui Point between 1897 and 1899, and was upgraded in 1902. Hilo Bay was still unprotected from high winds and storm surges that caused ships to break loose from their moorings and risk grounding. In the late 19th century, the growing sugar industry in East Hawai’i demanded a better and more protected port, and a breakwater was constructed on Blonde Reef to shield ships from rough waters as they entered Hilo Harbor. In 1908, construction began on a breakwater along the shallow reef, beginning at the shoreline east of Kūhīo Bay. The breakwater was completed in 1929 and extended roughly halfway across the bay. In 1912, contracts were awarded to construct Kūhiō Wharf, to dredge the approach to the new wharf, and to lay railroad track into the new harbor facility. Work was completed at Kūhiō Wharf, Pier 1 in 1916. Pier 1 was a 1,400-foot long by 150-foot wide wharf with a wooden storage shed. By 1917, a mechanical conveyor for bagged sugar with derricks for loading ships, was constructed. In 1923, Pier 2 was constructed just west of Pier 1. Additional dredging was conducted in Kūhiō Bay as part of the construction. By 1927, Pier 3 was added on the west side of Pier 2. Between 1927 and 1928, the approach to Pier 3 was dredged and the pier was widened. In 1929, the 10,080-foot long rubble mound breakwater was completed. Contrary to urban legend, the Hilo breakwater was built to dissipate general wave energy and reduce wave action in the protected bay, providing calm water within the bay and protection for mooring and operating in the bay; it was not built as a tsunami protection barrier for Hilo. In fact, in 1946, Hilo was struck by a tsunami generated by an earthquake in the Aleutian Islands; it was struck again in 1960 by a tsunami generated by the great Chilean earthquake – both tsunami overtopped the breakwater and Hilo sustained significant damage, including to the breakwater. (Lots of information here from Rechtman and Drennan.) 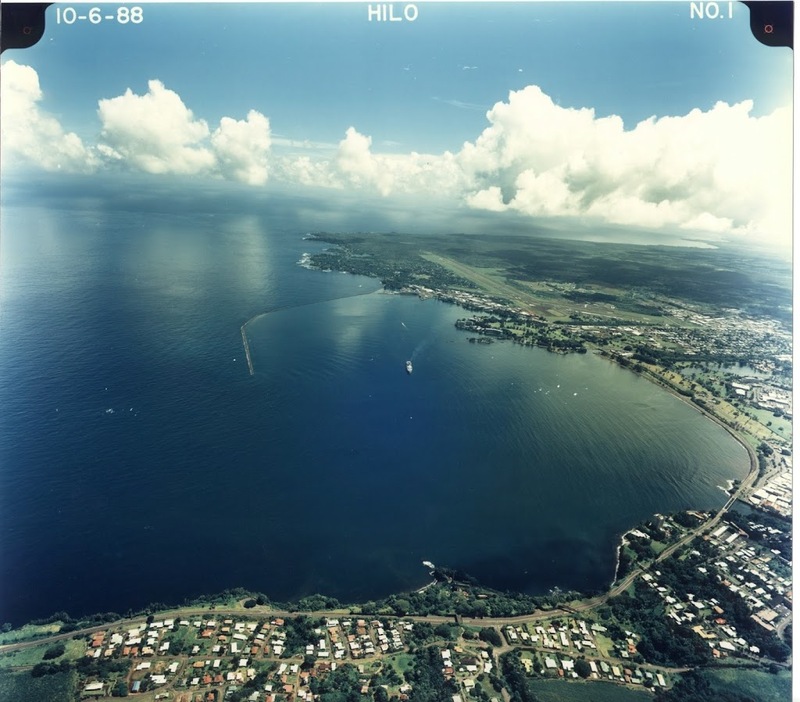 The image shows Hilo Bay and its breakwater (USACE.) In addition, I have added other images to a folder of like name in the Photos section on my Facebook and Google+ pages.